Wiseau is Back! The Room Director is at it Again! Oh hi, again. Cult fan favorite Tommy Wiseau is back! 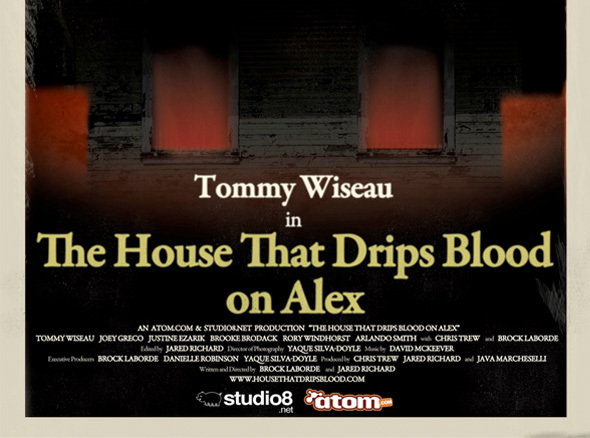 He is returning to the (small) screen in the short film creatively titled, “The House That Drips Blood on Alex.” Studio 8 in conjunction with Atom Films will bring you this (sure to be) gem. It will be premiering on Atom TV on Halloween. Unfortunately Mr. Wiseau did not write, produce, or direct this film, but since he is starring in the film we will get to see his uncanny acting abilities and weird euro accent put to good use. “THTDBOA” is a horror film that looks to be an ode to the Grindhouse films of the 60’s and 70’s. With that said it should be intentionally bad, so Mr. Wiseau should settle right in. The trailer indicates the title of the film is exactly the premise of it as said house is literally bleeding for some reason. “I did not hit the house! I did naaoot!” And for some reason this house is bleeding on Alex (Tommy). The plot sounds horribly amazing so let’s hope the film will quench the thirst of “The Room” fans that have been desperate to drink up any new Tommy Wiseau project (myself included). I for one cannot wait to see this film.